The Spanish and English leagues may be the epicentres of world football right now, but from 10 June -10 July 2016 it will be France that briefly takes over for Euro 2016, arguably the world's highest quality international tournament. From this Friday, 24 teams - including England, Wales, Northern Ireland and the Republic of Ireland - in six groups will play a total of 51 matches in 10 venues. You can, of course, watch all the games live on the BBC and ITV for free in the UK and on ESPN and others in the USA (check here for international broadcasters), but if you're after something beyond the usual TV punditry, it's to pod-land you must go. In-depth tactical chat and entertainment by people who actually know the game inside-out is just a download away. We've also got a comprehensive guide on how to watch UEFA Euro 2016 championship in style, which details the best ways to enjoy the football this summer. Punditry with a capital Pun. Back in 1992, Football Italia on the UK's Channel 4 was cult viewing for millions of Brits. The catalyst for live TV coverage of Serie A was Gazza's transfer to Rome's Lazio, but the highlight was the café-based banter from presenter James Richardson. He's still doing it on BT Sport's Sunday Night Football Show, but his best work is the decade-old Guardian Football Weekly podcast for The Guardian newspaper, which will transform into Euro 2016 Football Daily for the duration of the tournament. It never takes itself too seriously, but there's plenty of informed opinion from The Guardian's football writers Barry Glendenning, Rafa Honigstein, John Ashdown and Sid Lowe in between healthy doses of puns and wry enthusiasm from Richardson. Euro 2016 group previews are up now. Usually culled from the aftermath of a major live match commentary on BBC radio station 5 Live, the Football Daily Podcast is as hit-and-miss as the constantly changing roster of presenters, guests and pundits. Anyone from veteran commentator John Motson to Danny Mills and the easily riled Steve Claridge can feature. Occasionally you do get the Great British Public phoning in drivel about 'who wants it more', who's 'fit to wear the shirt', which is best skipped over. As such it can have a raw live radio, rather than a podcast-style sit-down chat, and it is can be irritating. However, the post-event feel can work really well after a really big occasion, such as a Euro knock-out match, especially if you want to re-live the big match atmosphere the following morning. This is also the place to hear the inevitable and unmissable Chris Waddle rant if/when England ungraciously exit the tournament early/meekly. Much of the best and least cliché-riddled analysis of British and European football comes from other continents, and that's certainly true for this independent podcast. It's hosted by two intelligent soccer obsessives from either side of the pond, Paste Magazine's Taylor Rockwell and Wolverhampton Wanderers fan Daryl Grove, and the Yank + Brit mix of chat and tactics has a fresh, entertaining and thoroughly professional delivery. For much of the year it's a bit too Major League Soccer/USMNT-centric for the rest of the world to stomach, but when international tournaments swing round the well-researched and original tactical chat is the perfect podcast to fill the downtime. The highlight is 'specific predictions', which the presenters base on their tactical analysis, which often goes against the accepted narrative, such as England's supposed leaky defence ('England will concede the least amount of goals in Group B' is a typical forecast for Euro 2016). At the moment there's in-depth coverage of the Copa America Centenario currently being held in the USA, but Euro 2016 groups are being previewed this week, and from Friday this thrice-a-week podcast will become a daily download. Essential listening after you've consumed Euro 2016 Football Daily. European Football Correspondent at The Times newspaper, Gabriele Marcotti knows what he's talking about. The host of half-analysis, half-football news catch-up The Game Podcast by Times Online, the Italian-American Marcotti has got better at interviewing of late, and the flowing discussions about tactics go way deeper than you'll read in print or hear on TV. It's bereft of in-jokes and not as funny as The Guardian's Football Weekly/Euro 2016 Football Daily, but Marcotti, regular guests Alyson Rudd, Rory Smith, Tony Cascarino and the carousel of phone-ins from football journalists and others makes this a valuable reserve resource during Euro 2016. Expect a 30-minute round-up and discussion from The Times every day during the Euros, though presenters are TBC. A daily digital download since the 'EuroCopa' six-weeker began (Copa America Centenario + Euro 2016) – and sure to cover every single game from Euro 2016 – here's another USA-born podcast with a nice spread of opinion from either side of the Atlantic. 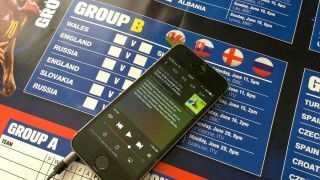 Ably presented by Nipun Chopra, online already are Euro 2016 group reviews featuring deep dives into both the tactics and the political backstory to some of the debut countries (notably Albania), though it's on the former that this podcast does it best work. Though the shouted contributions of Kartik Krishnaiyer can be a little grating, the serious, considered opinions of UK football journalist Kristan Heneage of ITV News and Yahoo UK are the highlight. His phoned-in insights via Skype are occasionally muffled, but this otherwise professional podcast makes an ideal daily download for the duration of Euro 2016 if you have time to kill between matches. Football Ramble calls itself 'the most entertaining voice in football' and for good reason: it really is. It's been on-air for getting on 10 years now and is an essential listen if you 'e interested in all aspects of football, not just the Euros. The show was created because its makers were annoyed at the state of sports broadcasts, always focusing on the big four instead of the wider game and because of this it feels like listening to your friends in the pub talk about the latest game - without teetering into 'Lads, Lads, Lads' banter.